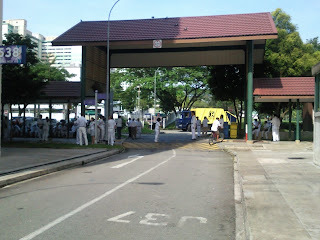 saw a lot of MIW men /women in white when i passed by JJC . MIW (men in white) supporters Outside JJC on nomination day! 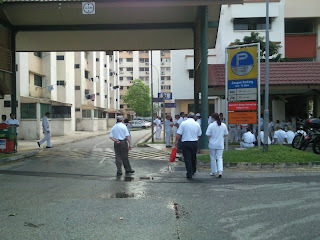 A rubbish collector stucked outside JJC gate. 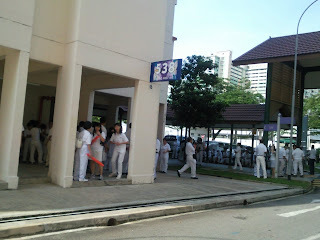 I thgt they are from RI or some sort of institutions. 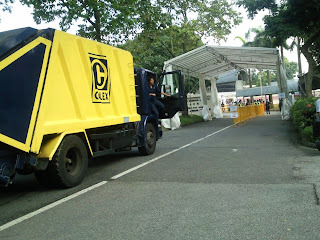 Upon me closer examination reveals that they are PAP supporters and candidates. These PAP members and supporters drew my attention as they are "making waves"
(sounds) at the viod deck of HDB flat next to Jurong Junior College. I'v never seen such a mass gathering at a hdb area in my life. 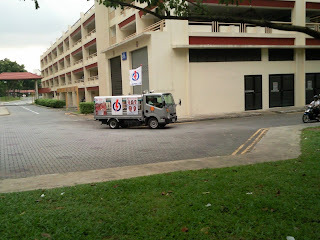 Later when it was announced in the afternoon that there will be a contestant from the opposition SDP, a PAP's vehicle is seen patrolling around Boon Lay broadcasting the party's message in various languages which include Dialect, Chinese , Cantonese, Malay and Tamil during the evening about 6pm. I guess its from the PM and his election candidates . The SDP vehicle is also seen installing the party's posters and flags symbols on lamp posts along Jurong East Ave 1 quite late around 6pm while all the PAP posters are already up the lamp posts before 5pm! in various languages: "... vote for party to secure your future..."